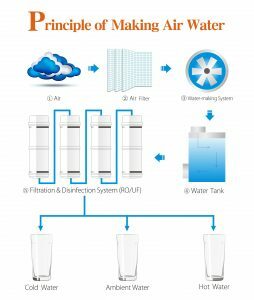 Air-to-water is generating safe and clean drinking water directly from the humidity in the air. A simple solution for small households or areas with low water access. The Air-to-water box is capable of producing from 20 L/ day up to 90 L / day. Just switch on and drink. Water from the air – environment friendly. High efficiency in producing and purifying water plus air purification and dehumidification. Water will go through a 7-layer of nanoscale filter without waste water discharged which is environmental friendly. Use high efficiency modified molecular sieve technology and HEPA filtration material, which can efficiently barrier dust, hair, particulate matters and noxious gas, to purify the air used to generate water. Recycling every 8-hour and keeping the water temperature around 12-18 degrees celcius to make it fresh all the time. Automatically turn on the ultraviolet disinfection mode every 1-hour and last for a-hour, preventing secondary pollution. Equipped with precise water-level control system, intelligent monitoring and reminding filter maintenance and replacement, PM2.5 monitoring. Mobile, put anywhere you like, press to drink, no transferred water, no stored water, no replaced water.